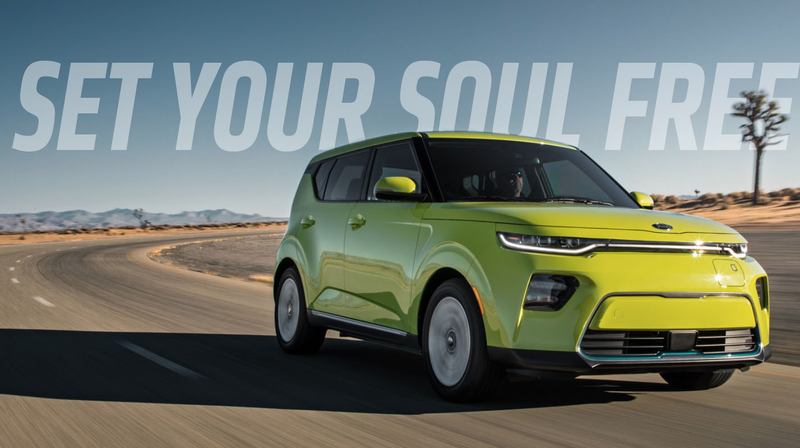 There’s a new Kia Soul coming, and even if the front end has a face with an expression that looks like it’s imitating that Fry meme, it’s still quite striking-looking and refreshingly not like everything else rolling around on the road today. Even better, Kia announced an EV version that should potentially have an impressive range of around 240 miles! Unfortunately, Kia currently only sells their electric cars in a very limited selection of states. This is crazy. Kia could eat the Nissan Leaf’s lunch if they take this nationwide. The previous generation of Soul EV seemed like your typical California/Oregon/etc compliance car: a conversion of an existing platform with specs that didn’t suggest all that much effort had been put into it. It only had a range of around 100 miles (a bit less, really) and 107 horsepower. It was fine, but that’s about it. This new Soul EV has really upped the ante, and now has a range that’s competitive with the best of them—Chevy’s Bolt and the Tesla Model 3—along with power output that’s a good jump over the gasoline model’s 147 hp: 201 electro-horses, if we can go by what the same drivetrain puts out in the Kia Niro EV. So, really, Kia has an EV that has great range, good power, and isn’t boring to look at. The non-boring part I think is quite crucial, especially since pretty much all EVs drive pretty much the same. Electric motors aren’t like gasoline engines, which have wildly different personalities and performance characteristics based on their design and layout—electric motors are pretty much electric motors, with good initial torque and smooth power delivery and that’s about it, whether it’s pulling up an elevator or drilling holes or driving your car. That means that for mainstream cars that aren’t going to do anything wildly radical suspension-wise, most EVs will feel pretty much the same to drive. That’s why other factors like design, space utilization, utility, novel layouts or features, all that other stuff, becomes so much more important. That’s why I think if Kia would sell the Soul EV nationally, it could completely rake away the Nissan Leaf, which has significantly less range (about 150 miles) and is as exciting as an actuarial table. The whole reason Tesla became as—if not monetarily—conceptually successful as they are is that they made electric vehicles desirable. Remember, prior to Tesla, most people still thought of EVs as glorified golf carts—slow, dorky, and mildly embarassing. Tesla made fast, sleek, desirable cars, and that changed the perception of electric cars dramatically. Now an EV can be cool, something that just wasn’t the case back in the days of Comuta Cars. Well, I mean, I think the Comuta Car is cooler, but everyone agrees I’m an idiot. Nissan, though, doesn’t seem to have gotten the memo, and is building cars like the Leaf with lower range and all the personality and charisma of a gray three-ring binder you find forgotten in the way back of a supply closet. It works fine, but it would take very illegal drugs to make you able to actually desire one. Plus, if you’ve been holding out for the promised long-range Leaf, it’s looking like you may be holding out for a bit longer. But the Soul EV? It’s interesting looking and actually very practical, thanks to its boxy design. It’s got the range numbers it needs to not just compete, but to actually do its job well, without making people nervously wondering if they’re going to make it home all the time. Plus, at an estimated price of around $33,000 (if we go by what the current one costs, which is still about double the price of the base gasoline Soul) it’ll be one of the most affordable 200+ mile range EVs out there. The current Leaf, with its 150-mile range and damp-sandwich charm, is about $31,000. Not a lot of difference. The Soul EV is a good example of how to do an an EV right. We need affordable EVs, and we need them to be interesting, otherwise, how are you going to get anyone to care enough to take the leap? Kia needs to step up and quit pretending the Soul EV is just a compliance car they don’t have to try to really sell. If Nissan can sell Leafs all over the country, there’s zero reason why the Soul can’t do it, too, and, very likely, do it better.